This sheet of sketches shows the Renaissance artist using drawing as a natural medium for experimenting with pictorial ideas, whether in preparation for a commissioned work or to work out individual figures in one or more compositions. The lively and varied pen technique with which the movement and expressivity of the figures have been captured comes very close to Filippino Lippi´s drawing style in the last decade of the fifteenth century, as evident in both his drawings of the Nereid with Putti and the Sibyl (Goldner and Bambach, nos. 63 and 49). For a similar treatment of the hands, which are slightly awkward, compare the Dancing Putto (Goldner and Bambach, no. 84). The bristly hair of the young ecclesiastic in the center of the composition is a feature that is also found in Filippino´s drawings (e.g., Goldner and Bambach, nos. 33 and 37). One of the most gifted and accomplished Florentine painters and draftsmen of the second half of the fifteenth century, Filippino Lippi trained first with his father Fra Filippo Lippi and then in the workshop of the painter Sandro Botticelli. Well over one hundred drawings are attributed to him (Goldner and Bambach, 1997; Shoemaker, 1975), some highly finished and some energetic late studies reflecting considerable spontaneity, such as the present drawing. The subject is a mystery. The seated clergyman might be a cardinal, but as he is wearing a biretta he could be of lower rank. 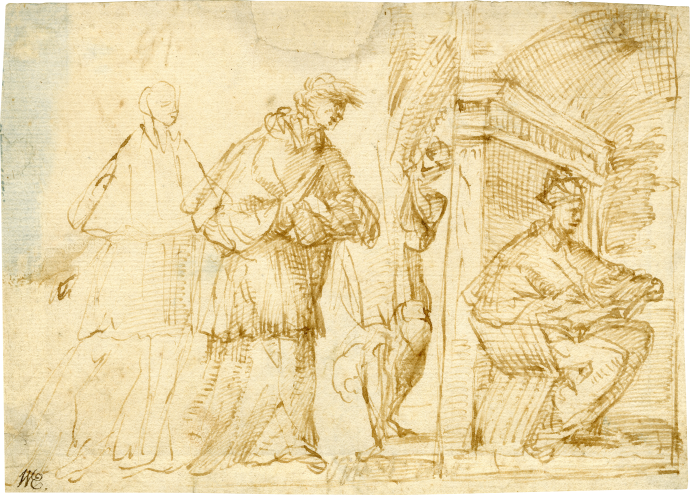 It is not quite clear if this is a composition drawing for one scene or if it is in fact two separate ones; however, the format suggests that it is preparatory for a predella panel. Pen and brown ink, some blue wash in upper left, on paper, notation “966” in pencil on mount, remnant of a watermark upper edge of paper; repaired at the top center, else in good condition. William Esdale (1758-1837), London, banker and collector of prints and drawings, his collector’s mark lower left corner of recto (Lugt 2617); John Thane (1748-1818), London, dealer in prints and coins, his collector’s mark in graphite on the verso (Lugt 1544); Sotheby´s, New York, 27 January 1999, lot 3. We are grateful to Chris Fischer and Innis Shoemaker for their expertise.